My last Murakami outing was a Surreal book,After Dark .But,I loved it to bits. That prompted me to pick this book up. 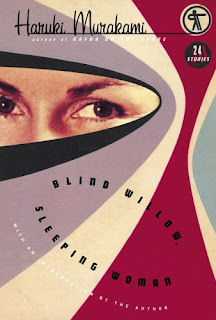 Blind Willow,sleeping woman is a collection of short stories ,that has gone on to garner rave reviews. There are very few books that are exhilarating and depressing at the same time. Murakami's writing somehow manages to be both.After the first few stories,I wondered why the book was so critically acclaimed. After all, the writing didn't seem very proficient,being loaded with superfluous similes, metaphors and dark philosophical undertones . The stories seemed to have a pattern- talk about totally unrelated things and end in a open-ended manned that made me want to tear my head out. Closure, is not something literary fiction brims with ,I guess. Every single story was left hanging in the air, as if waiting for me to figure out the ending. Several times,I wondered if the simplistic and often absurd plots had more depth to them than what I was giving credit for and that it was Murakami's way of secretly mocking the reader. A few more stories into the book,I could visibly feel my pulse soaring. The strange world Murakami concocted with every single story made me want to read on.I started appreciating the point of all the pointless details he was getting into in the stories. The philosophizing and dark overtones actually started growing on me and I found myself reaching for the book in between chores. Yes,the book is deeply disturbing. Yes,sometimes the plots seemed outright absurd and innane. But, the stories brim with originality.I don't think I have read any compilation of short stories that has the range this book has. Simply superb!. Murakami draws heavily from his love for Jazz and quite a few stories mention obscure Jazz artists and even more obscure records. Paul Gauguin finds mention a few times too. A word of caution though-if you don't tend to take kindly to depressing books,you might find a strange sense of gloom settling over you as you thumb through the book.The protagonists in the stories are either depressed or indulging in affairs or suicidal or sad or confused. Doesn't entirely make for a wholesome or happy reading.But the visual imagery invoked by the stories is so potent that the words take your breath away. There is a huge degree of truth to most observations Murakami makes. I just wonder how it would have been to read the book in Japanese.Alas,I'll never know,unless I decide to learn the language. A full on 5/5 for this exhilarating piece of work! I know I've mentioned "exhilarating "a few times in this post,but that's exactly how i felt reading the book. Go grab it ! Wow, a 5/5 ! I mush grab this one quickly. Thanks for the lovely review. Hey Veens,I am doing good. How's everything with you in Mumbai ? Terrific review! Maybe I will read this collection for the Japanese Literature Challenge 5. Suko.. You must pick up the book for the challenge.. Good fun! Well written review..Guess it is making it to my TBR Pile..